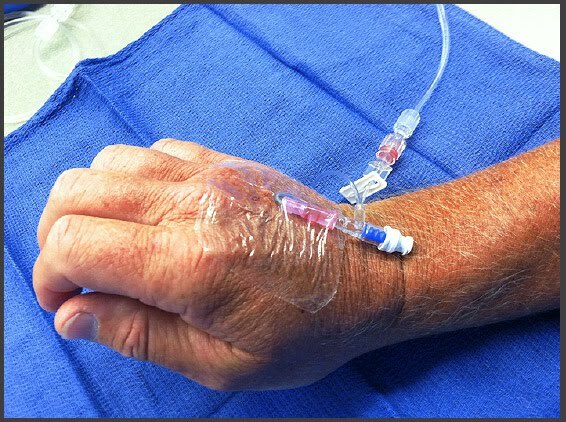 The BetterIVTM catheter is a very simple, elegant and Patent Pending modification of current technology that allows the IV catheter to flex into whatever position is best without kinking and pistoning. It makes a much lower profile, can be used in the antecubital vein without as much concern for failure, and is much more comfortable for patients. Because it alleviates the problem of the “positional” IV that causes pump alarms and it may last longer than traditional IVs, it may save time, money as well as pain and suffering for patients who would otherwise have to be “stuck” again to re-establish critical IV access. In the photos on this website you will see handmade basic prototypes of a BetterIV used to demonstrate the idea for the purpose of getting input from folks like you. We hope to gauge interest and decide about further development. No special training or equipment is required to place a BetterIVTM. The device is slightly longer than standard ones but is otherwise identical in placement method and feel. 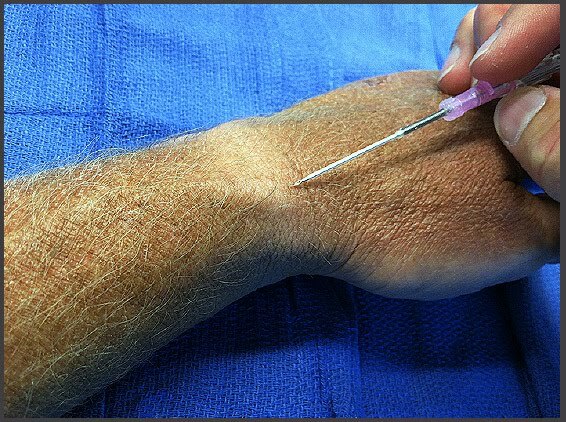 The only difference is in how it is secured to the skin after the needle is removed. 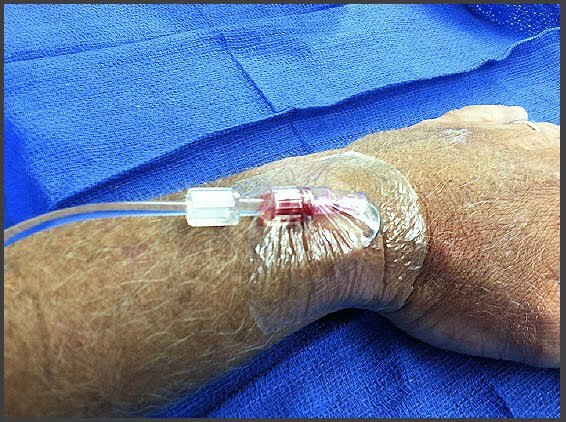 Notice how the BetterIVTM is able to curl away from the wrist allowing a more comfortable position and less chance of the catheter kinking. Note how there is a large loop of tubing that must be taped to the hand. You can keep scrolling down to see more, or you can click to see THE TECHNOLOGY that makes BetterIVTM different. Please be sure to take our SURVEY before you leave the site! 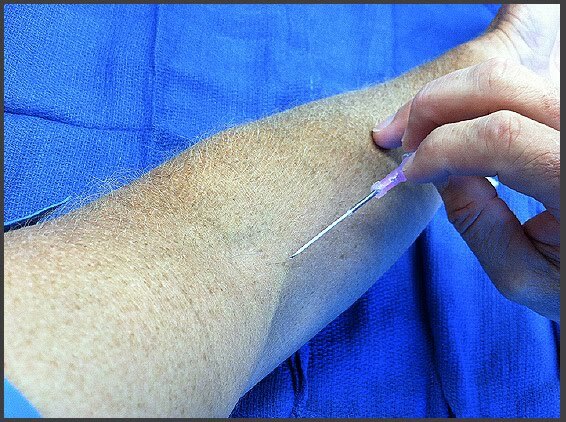 BetterIV is inserted into a vein just like any other standard IV catheter. 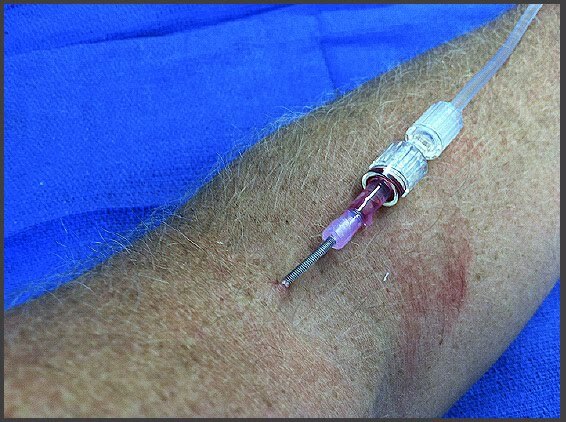 This photo shows the infusion tubing connected and how the BetterIV catheter flexes without kinking. 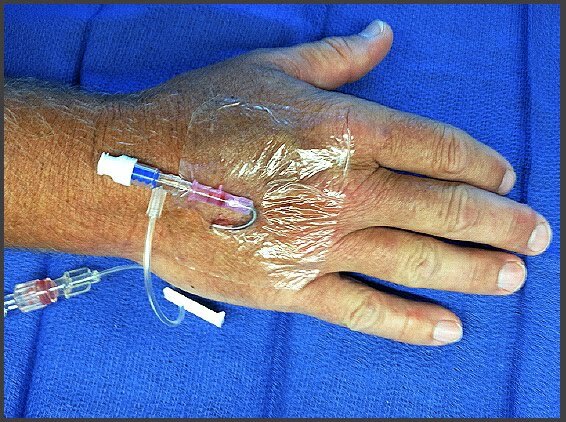 Note how the loop of tubing out over the knuckles that is common to standard catheters is avoided and a low profile and comfortable IV access is achieved. 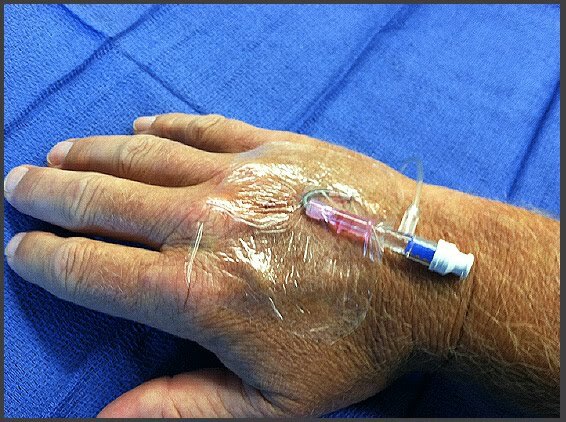 This photo demonstrates how BetterIV allows for comfortable flexion of the wrist and has no loops of tubing that can catch on things as a patient moves while eating, dressing, walking or during surgery. 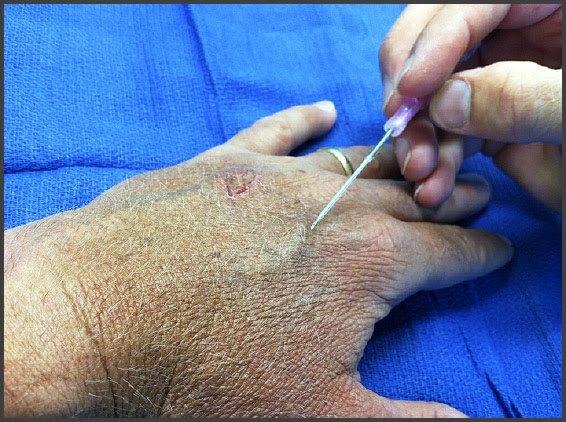 A dorsal view of a BetterIV installed in a hand vein. 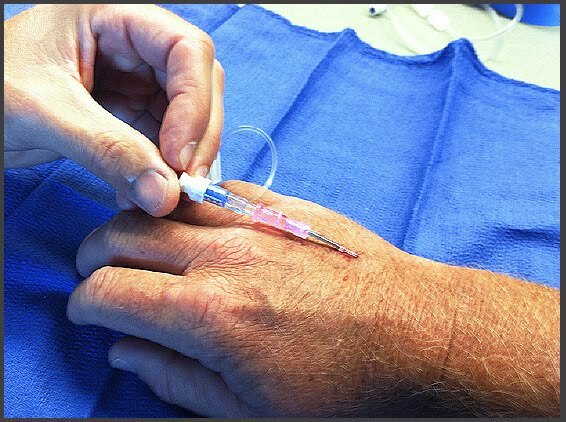 Placing a BetterIV catheter in a wrist vein starts like any other standard catheter. 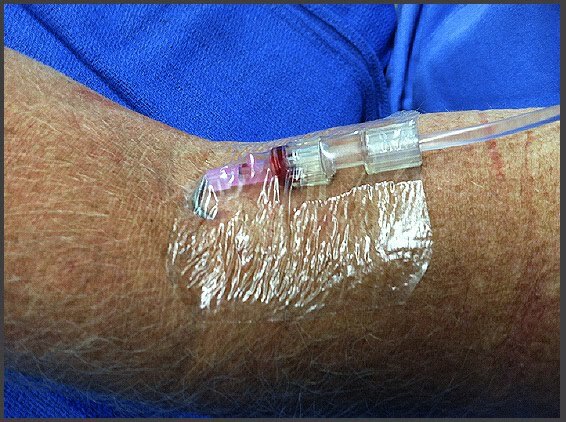 Note that it is slightly longer and has a spring reinforced section of tubing near the hub, otherwise it is the same as a standard 20 gauge IV catheter with a sharp needle and smooth thin tubing that slides easily into the chosen vein. In this case it is the commonly used “Intern” vein near the wrist. I am making 20 gauge devices for my prototypes now since that is the most commonly used size but will expand into other sizes when production begins. 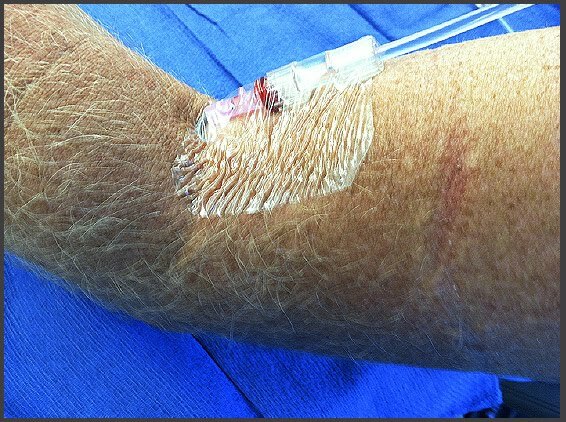 Here is the BetterIV in place with a clear dressing leaving a low profile IV access that allows the patient to move their hand and wrist without the catheter pistoning in the vein or causing IV occlusion and alarming pumps. Note how this has been accomplished by simply placing the catheter in the vein using standard technique, removing the needle and simple bending the easily flexible spring-reinforced section to the desired angle before securing with adhesive film. Securing can also be easily accomplished with a StatLock device. This device will be particularly good for laboring patients as they are using their hands to grip handrails/husbands while they are pushing and will prevent IV occlusion and dislodgement during this critical time. It will allow the attending RN and Physician to pay more attention to the task at hand. BetterIV Catheter prior to insertion into antecubital vein. 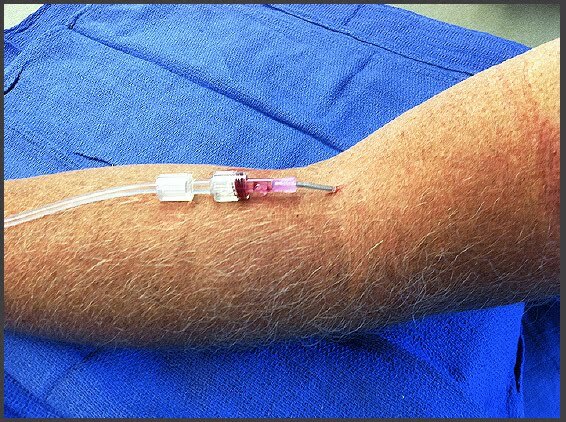 BetterIV catheter inserted into antecubital vein and connected to IV set. So that flexing the arm does not kink the catheter. This will be more comfortable for the patient and help the IV last longer.